What to make? Please choose from 15 types of bread. 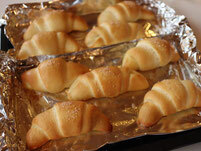 I selected 15 recipes among a lot of “Licht recipes” that would be strongly recommended to tourists. Strong bread flour that is used in Licht is all domestically grown. 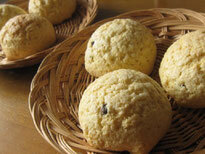 Some of the flours we use are produced by a farmer in Kurobe city (Toyama Prefecture). 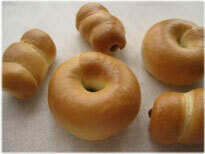 Healthy bagels are very popular for it’s chewiness coming from boiling the dough before baking. Another reason why is so popular is that you can make it in a relatively short time. 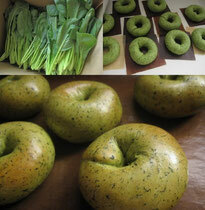 A Komatsuna producer in Imizu city gave me an idea to use Komatsuna for bread, so I produced a bagel recipe. 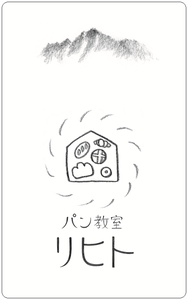 We will make a Komatsuna paste as well. 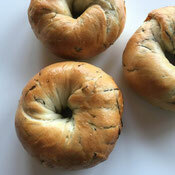 I arranged the recipe for Kombu bread into the one for Kombu bagel. This potato focaccia is easy to make at home. You can surely make anyone from adults to children happy by making it. Kelp is loved by citizens in Toyama prefecture. So, I tried to make the recipe that locks in the umami from kelp. 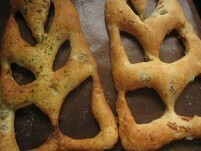 Making a few cuts with scissors on the shaped dough, then it looks like a tulip when it is baked. 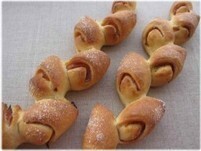 This is a recipe that you can easily make popular bacon knots, which is recommended for a family lesson. 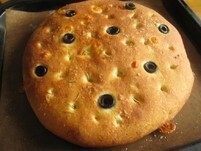 This is a thin bread that has a leaf shape by making two cuts in a line, kneaded olives and bacon into a dough. It will be an excellent gift or present. 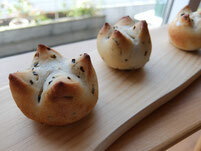 This bread is very popular in Japan. I tried to make it easy to eat by cutting oil content. 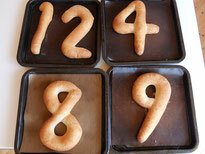 Why not give someone a special bread with the shape of numerical character of their birthdays and anniversaries? Please choose two characters from “0” to “9” and let me know when your make a reservation. 100 yen will be charged for every additional one character if you would like to make three or more characters. 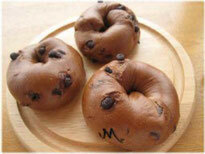 This is a bagel as a sweet. It has plenty of Valrhona Cocoa and chocolate. 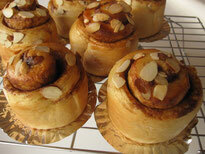 This is a specialty recipe that I made for those who love cinnamon. 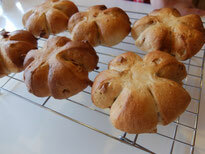 It takes many steps to make since we have to make sweet buns and thin layers of cookie dough to cover the bun. It is recommended for those who like baking and cooking. This is a mildly sweet walnut bread made by a well balanced rye flour and walnut. 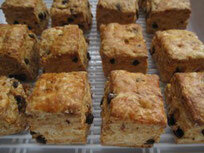 Plain scones can be made in relatively short amount of time and be arranged freely. The one with Egoma is strongly recommended as well. 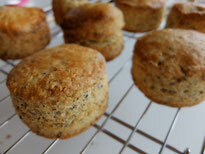 I made this scone recipe to be enjoyed not only with black tea but also go well with coffee and milk.